Today, somewhere, someone probably asked this question for the first time, and yet I’ve been aware of this question for my entire adult life. So, before I try to address the question, let me ask first, how long have we been asking this? The ancients didn’t ask it. It seems clear that if one goes far enough back in most cultures it was taken for granted that poetry would be sung or accompanied by music. It seemed to make little difference if it was an epic story or a condensed lyric expression, music was assumed as appropriate bordering on required. Was there a progression away from music being expected with poetry in those times? I wish I could say I was scholar enough to answer that question here. As literacy became widespread, as the collecting of libraries increased, I assume more people may have read Homer or Sappho* on the page than heard their works performed. And similarly, when Confucius and his school collected The Book of Songs they may not have assumed that each student would learn to sing and accompany each of them. Still it would have been absurd then for someone to judge that these works could not be poetry because musical accompaniment and performance had been associated with them. If we stay with English language and move on, we know that the Elizabethans recognized some poetry as destined for the printing press’s page, some for performance on the stage, and some for musical settings as songs. Poetry could be associated with music, but it wasn’t the default. Continuing to sweep forward quickly, a few Romantics like Robert Burns wrote songs and Blake was reported to sing some of his work as well. Some of the prime British Isles romantics wrote literary ballads or the like, works that referred to song forms but without associated music, meant to be seen on the page. 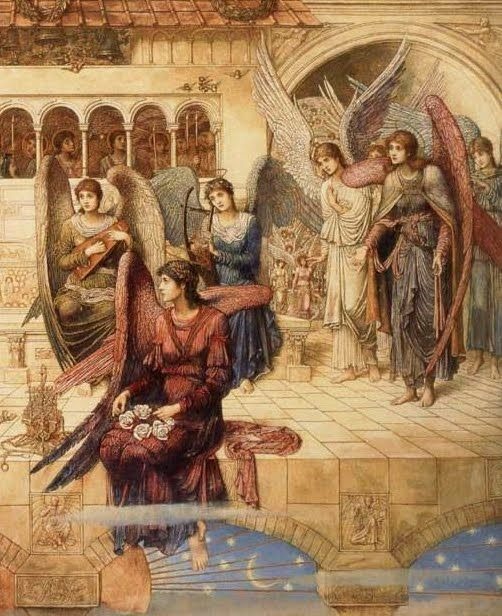 Likewise, there seem to be only a scattered few in the late-Romantic/Victorian era and onto the early English language Modernists who were musical composers and poets or who assumed musical performance for their chief works. Long-time readers here will know that I like to point to Yeats as an exceptional example to this. For a time he pushed for poetry as performance with music and may even have composed or aided in the composition of some of the accompanying tunes. Little of his crusade survives, though it’s possible that one of the tunes to which his poem “The Song of the Wandering Aengus” aka “The Golden Apples of the Sun” is sometimes sung might be his, or personally approved by him. That Yeats was closely associated with drama and theater may have something to do with this. Newly composed poetic drama is an uncommon form in the modern era, but drama normally presumes performance. Although readings by poets are common in the 20th and 21st century, the nature of the performances vary considerably, and it became common for poets to give dry readings that by the writer/reader’s nature or intent drained dramatic and performance elements from the reading. Let’s stop for a moment and consider two unlike American poets who emerged in the early 20th century: Vachel Lindsay and T. S. Eliot. Lindsay, who came and went well before the first Beat poet stepped in front of a jazz combo can easily be seen as the original slam performance poet. He wrote his poetry expecting to perform it. Associated with that expectation, his writing is designed to impact the back row of the auditorium immediately, and if he ever wrote a poem with layers of meaning or intentional ambiguity, I’ve never come upon it. Eliot on the other hand, read somberly in public, but as much (or more) as Lindsay he seemed to inform his poetry with music. As I return to my serialized performance of his masterwork “The Waste Land” this month I’m reminded of music’s considerable presence in it. He samples music in his great poem just as a modern hip hop composer might, dropping in scurrilous barracks ballads, pop songs, Wagner opera, and birdsong. He didn’t perform it as floridly as he wrote it, and so even if “The Waste Land” bore an original working title of “He Do the Police in Different Voices” Eliot does not do the voices when reading it, nor does he sing the music he’s decidedly referencing. It can be performed however, and while the poem’s detailed layers and references won’t come through in one sitting, a performance like Fiona Shaw’s illuminates the emotional and character range in it better than anyone’s silent first (or probably tenth) reading of it will. My performance of “The Waste Land,” now about half complete, attempts to bring the abstracted music back to life in the poem, even if I reserve the right to select genres and modes of expression that Eliot might not expect. When I perform a poem like Vachel Lindsay’s “Abraham Lincoln Walks at Midnight” I expect you’ll get as much, or perhaps even more, from hearing it once as you would reading it on a page. One of the knocks on poetry with music, or performing poetry in general, has been that it doesn’t help subtle and complex thoughts in poetry come through the way that slow reading on a page where one can look up and down the page at will does. I’ll agree there’s a non-linearity in reading poetry on the page that is difficult to translate into performance. But does musical performance of words prevent “re-reading”? Music rejoices in repetition. Words used with music often take on refrains and repeated sections. I will sometimes create such refrains even if the original page poem doesn’t include them. Gospel and other ecstatic performance styles have been known to drill down to word or syllable level in repetition, again, somewhat compensating for that weakness of performed poetry vs. its non-linear presence on the page. Particularly with recordings (although repeated performances have the same virtue) you can re-experience the poetic text for comprehension of different levels or different vectors of observation. When I’m attending a poetry reading, I’m often worried that I will not be able to keep up the level of attention on the poet’s words as they read them throughout an entire night. This is irrespective of the value or quality of the poetry. A good poet is quite likely to cause my mind to explode with exploration engendered by a line, and I’ll find on my return that I have missed the rest of the poem! And a really good poem can blank out the next several poems. On the other hand, a simple text like Otis Redding’s song “Respect” as performed by Aretha Franklin and band can bear (for me) hundreds of listens. I will notice new things each time, or given the decades over which I’ve heard it, I may re-notice things I’ve forgotten I’ve noticed before. These revisits will also reach favorite moments where I wait for pleasures to return. A knottier text like Bob Dylan’s “Just Like A Woman” once seemed like a way to vicariously experience a certain kind of demimonde I was only peripherally experienced in. Listening to it over my life tested it against theories that it was about gender fluidity, or that it was a patriarchal endorsement of the male gaze and privilege, and now I usually hear it more as an expression of two addicts negotiating their other relationship besides the one to the chemicals and the situation that obtains them. It may be none of those things, or it may not always be one of those things. It may be something different the next time I listen to it. 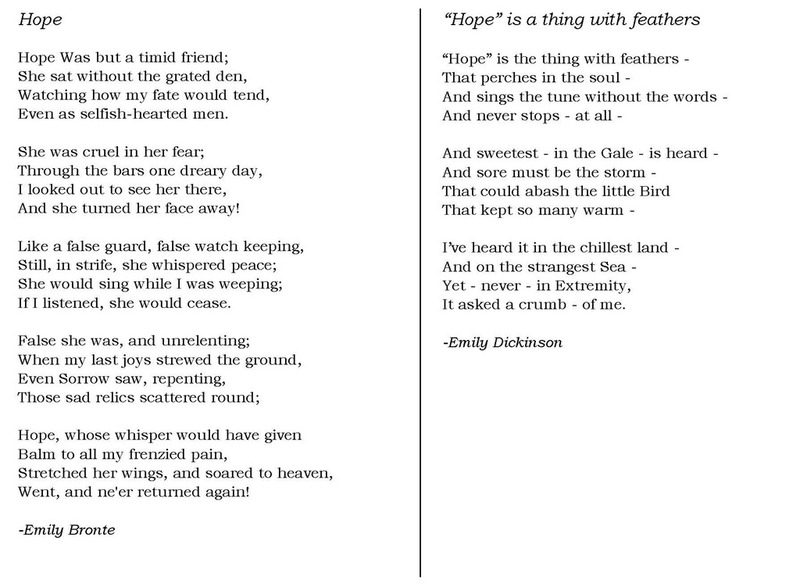 Why shouldn’t Emily Dickinson’s “Hope is a thing with feathers” or Wallace Stevens’ “To the Roaring Wind” get the same chance? Of course we can re-read a page poem, or read it and double back to check some connection, but particularly with short poems, might not music encourage repeat play? In this first part we’ve talked more about poetry and the perception that it has become increasingly separate from music. In the second part we’ll come from the other direction, and talk about song lyrics and that old, but not ageless, question about if they are poetry. I’ll leave you with my performance of Yeats’ “Wandering Aengus.” We don’t know exactly how Yeats would have wanted it performed, but his writing on poetry with music indicates he didn’t want the performer to sing it in an art-song manner. Perhaps I’m complying with his wishes, but then I can’t really pull off full-voiced art song. 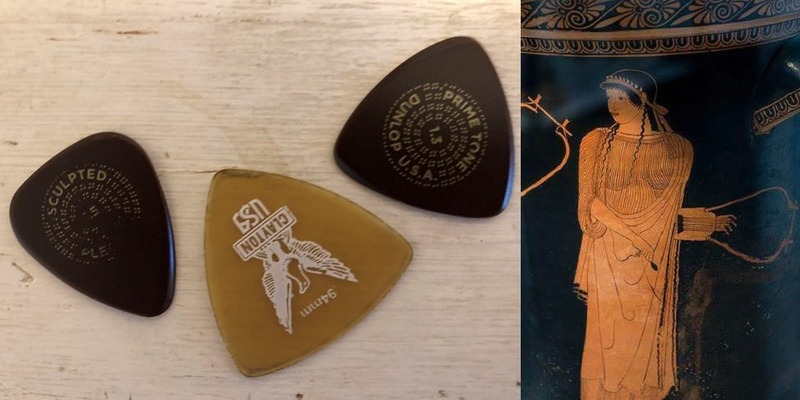 *My favorite Sappho legend—as a guitar player that must have the right flat pick to approach the instrument—is that she invented the plectrum. Isn’t it odd that early 20th century Modernists used the locomotive as one of their talismans? After all the railroad train wasn’t particularly new at the time, though like buildings and the airplane it eventually became a fine armature upon which to sculpt the curved Streamline Moderne style—but that was later in the century, and before it arrived the train was already the nightingale of the make-it-new crowd. It probably comes down to speed and power. Much of America in the pre-1920 years was still held between walking and horse-saunter speed, trains were exceeding the magic mile-a-minute rate, a supersonic difference to then. The sight of a long train rolling through the countryside must have been a majestic contrast of speed, noise, and human-constructed momentum. Even poets later in the century could have a train poem in them somewhere. Limited. 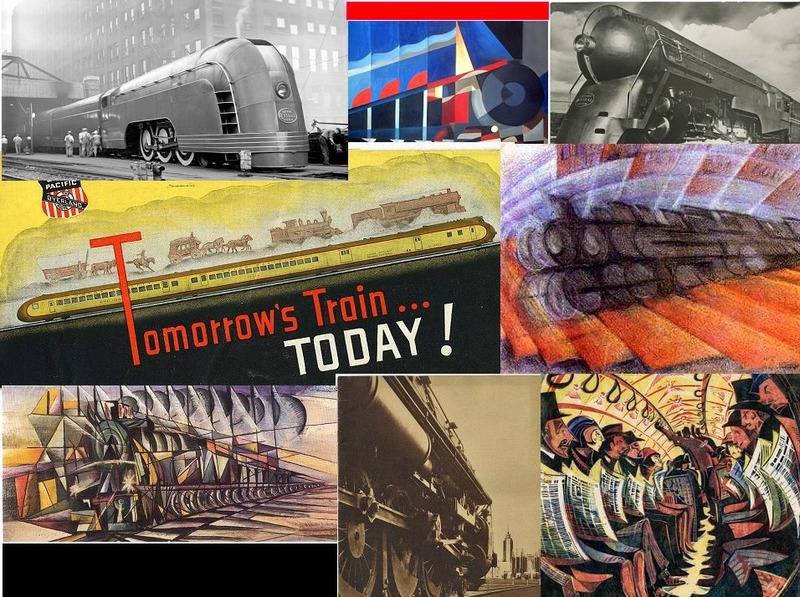 Shortly before he died, my father told my son and I that he recalled one thing from his childhood visit to the Chicago Worlds Fair in 1933-34, the Zephyr streamlined train. That year we visited it, exhibited in the Chicago Museum of Science and Industry and sent him a picture of us by the train. 20th Century musicians loved the train too and its rhythms, that rattling phrasing and doppler marcato. For this performance of “Limited” I tried to touch on that and let some guitar tracks run out. You can hear it with the player gadget below. Not a long text today, but for those who like to see as well as hear the words, click here. *One of the interesting side-lights I picked up in Genevieve Taggart’s Emily Dickinson biography, one of the first full-length treatments of her life and work, and written early enough that she could talk to people who overlapped Dickinson’s life in Amherst, was that her domineering father, who looks so stern and austere in his photograph was well known in the community for always wanting the fastest team of horses in for his buggy. I see Vin Diesel et al in a prequel Fast and Amherst, but Drift it Slant. Hollywood, call me, I can put the blog aside…. Here’s another post in one of our National Poetry Month series: The Roots of Emily Dickinson. We’ve already touched on Emily Bronte, who’s fierceness inspired the American Emily; and Helen Hunt Jackson, a childhood classmate who encouraged Dickinson to publish her work. * Today we look at a poem from the foremost public intellectual of her region and era, Ralph Waldo Emerson. We’ll see how it connects to Dickinson, and you may be surprised at how current Emerson’s thoughts about water are. It’s difficult to think of a modern analog to Emerson. It’s not an exact fit, but Oprah Winfrey could be put forward—but that understates the level of Emerson’s pioneering in the mid-19th century when America was still seen as a backwater. Like Winfrey, Emerson’s approval or endorsement could do much to help a new writer come to the fore. Emerson’s opinions, not just on the arts, but on public culture in general, about how best to live and shape one’s own life, were widely distributed and read by a broad readership. 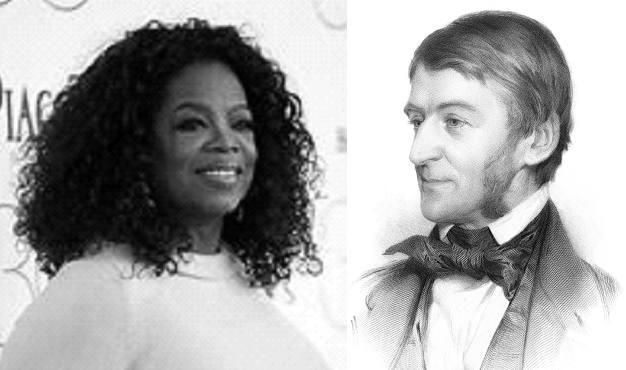 But even if similar in fame and broad impact, Winfrey has never pretended to be a philosopher herself, while Emerson was viewed as a central figure in a movement called Transcendentalism. What is Transcendentalism is a book-length subject, but there are, within its core, beliefs in the powers of individual insight over religious authority and the desirability of a close reading of the book of nature. If it was the middle of the 19th century, the guy on the right might be your Oprah. When I would read Transcendentalist writings more than a hundred years after they were written, in my 1960s, I would be struck with how often (if one gave some allowances for language changes) they sounded like a hippie critique of 20th century culture,** and in the half-century and more since, if I dip back into them, I find some of their focus surprisingly contemporary. Was Emily Dickinson a Transcendentalist? I can’t say for sure, but it’s near certain that Transcendentalist ideas, particularly as expressed by Emerson, were familiar to her. His thoughts were in the newspapers and magazines she read in her lifetime. We know she had been given a book of his poems by a friend, and we know she read them, and even copied at least one of them in her own handwriting. It’s possible that she attended one of Emerson’s popular public lectures. 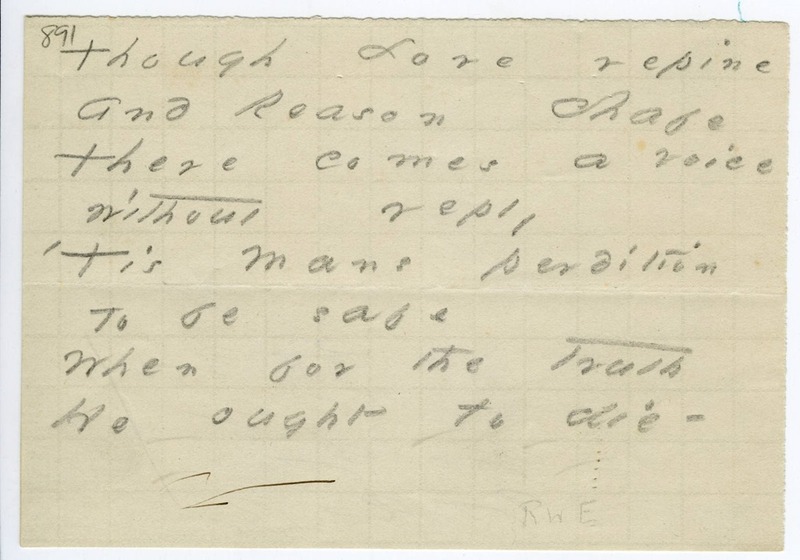 Part of Emerson’s poem “Sacrifice” copied in Emily Dickinson’s own hand. Emerson’s poetry rarely works well, and Dickinson is a great poet, yet in poems like today’s Emerson selection “Water” I can see similarities between them. Emerson punctuated his poem as one purported sentence, but its syntax is impossible to follow, and so “Water” is as fragmented as one of Dickinson’s heavily dashed poems. Incredible leaps occur from line to line with no attempt to bridge them with explanatory connections in either poet’s work. Emerson begins his poem with a striking phrase, similar to many of Dickinson’s great first lines: “The water understands/Civilization well;” but we soon meet a strange homey image of sticking a toe (or foot) in it, and Dickinson too loved to mix the universal and the mundane. Emerson’s poem develops with water personified as not having or having certain feelings, and then with little preparation we’re warned it can be the destroyer. I think Emerson is making a very modern point here, one that he expressed also in his essay “Civilization.” When water is respected and harnessed appropriately for its utility *** we are in harmony with nature’s nature. But, if we ill-use nature, we literally go against the tide, and water will be our destroyer. 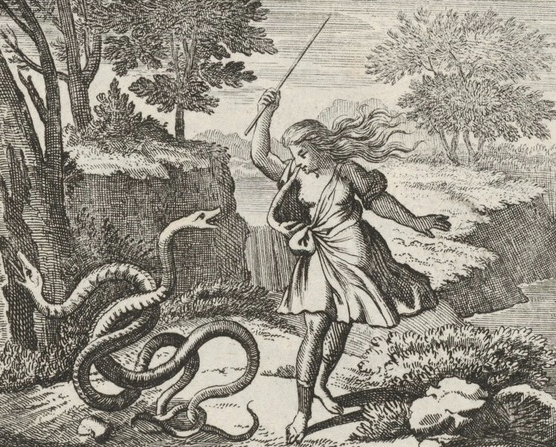 If Dickinson was influenced by Emerson’s ideas and outlook, and if she picked up his individualist style that dares to be somewhat obscure to stay true to the individual’s perceptions, why is she so often a great poet while Emerson isn’t? I think Dickinson makes better word choices both for sound and impact. Having “decketh,” “adoreth,” and “doubleth” as three wet dish-rags in a four-word stretch is enough to make Emerson’s poem soggy. And Dickinson has a talent for intriguing mystery that pulls us along even to places we don’t fully understand. She does that partly with her hymn/ballad rhythms which Emerson doesn’t use. Dickinson is usually more immediate too. A few posts back I stated that a poem is not about ideas, but the experience of ideas. 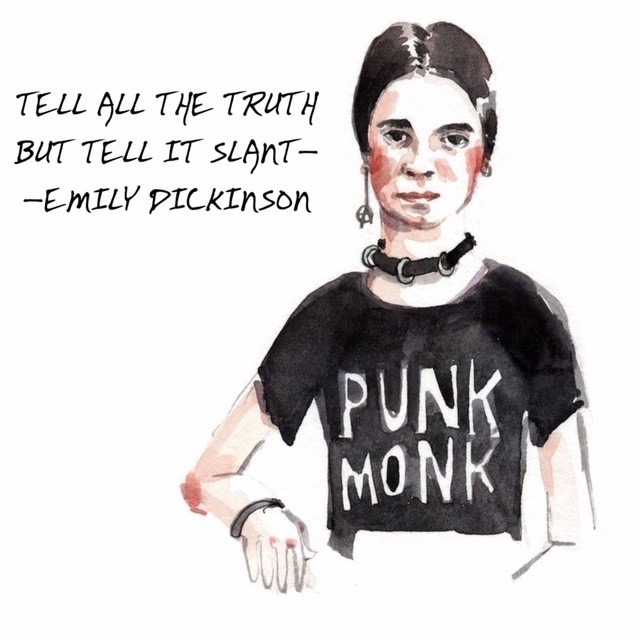 In an Emily Dickinson poem, I’m more often able to feel I’m experiencing those ideas as the are perceived, where I feel Emerson is summarizing his thoughts after the fact. Unafraid, I waded through the -eth words and performed Emerson’s “Water” with my own music, and you can hear it with the player below. And here’s the text of Emerson’s poem if you’d like to follow along on the page. *With the exception of one poem, which was published anonymously while Dickinson was alive, Jackson failed at that. Still, I think it possible that having some knowledge of her friend selecting poems for publication could have been motivation for Dickinson to create her hand-written booklets of poems which were found after her death. **This is for good and ill. Idealistic critiques of society are important, but adventurers often take wrong turns. And idealists have a hard time figuring out viable new structures. ***Emerson’s Massachusetts led the nation in using water power for small to large industry in the 19th century. So, when the city of Minneapolis was founded largely due to it’s exploitable water power, a good portion of the city fathers had New England backgrounds. Many Minneapolis streets still bear the name of 19th century New England luminaries, including Emerson. Alas there’s no Dickinson Avenue, as Dickinson’s poems were not published until close to the end of the century.